Book us for your Spring, Summer, Fall or Winter getaway. Now open year round! Welcome to Birch Forest Lodge on beautiful Pelican Lake in Orr, Minnesota! We’d love to share our family friendly Minnesota fishing resort in Northern Minnesota with you. Our resort offers 12 exceptionally clean Minnesota cabin rentals nestled on over 1000 feet of amazing lake shore. Many of our cabin rentals are newly remodeled and all are well maintained and very clean. Our cabins range from 1-4 bedrooms. And we are pleased to announce, 7 of the cabins (plus the Black Bear Room in the lodge) are equipped with air conditioning! Each cabin is unique in layout, proximity to the water and history. 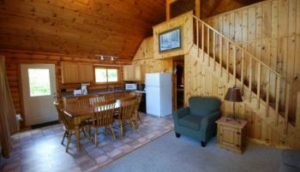 Whether you are a large family wanting to plan a summer get-together, a couple looking for a quiet fall getaway or a group of guys wanting to fish one of the best fishing lakes in Minnesota, we have a cabin that will be perfect for you! We also offer exceptional resort amenities and a variety of fun resort activities which include a fantastic swimming beach with volleyball, a large playground, lodge game room, canoes, paddle boat, stand up paddle boards, kayaks, and spectacular sunsets. All that and great fishing on Pelican Lake too! 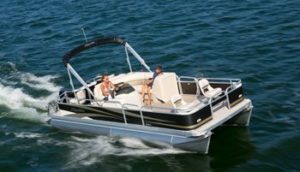 In addition to the cabins and resort activities we also operate a small marina with boat and pontoon rentals. Bringing your own boat? Not a problem, you are welcome to rent a dock slip at our brand new dock. Premium gas, leeches and night crawlers are sold at the marina. In the lodge we have a game room and a small gift shop where you can find a souvenir or an ice cream treat! We look forward to being of service to you, and hope to share with you all the things that make Birch Forest Lodge, Pelican Lake, and Orr, Minnesota an unforgettable vacation experience. Interested in a cabin rental? See what is available with our online reservation system. If you have any additional questions about our cabin rentals or boat rentals please feel free to call us at 218-757-3479 or email us at info@birchforestlodge.com. Also, please view the video below to learn more about Birch Forest Lodge!